When was the last time you actually sat down and talked about your company’s knowledge management (KM) strategy? KM used to be something that ran in the background. Technology, though, has made it possible to capture, identify, and distribute company information quicker and more efficiently than ever. Success results when well-trained employees have access to a great knowledge management system (KMS) and know what to do with it. 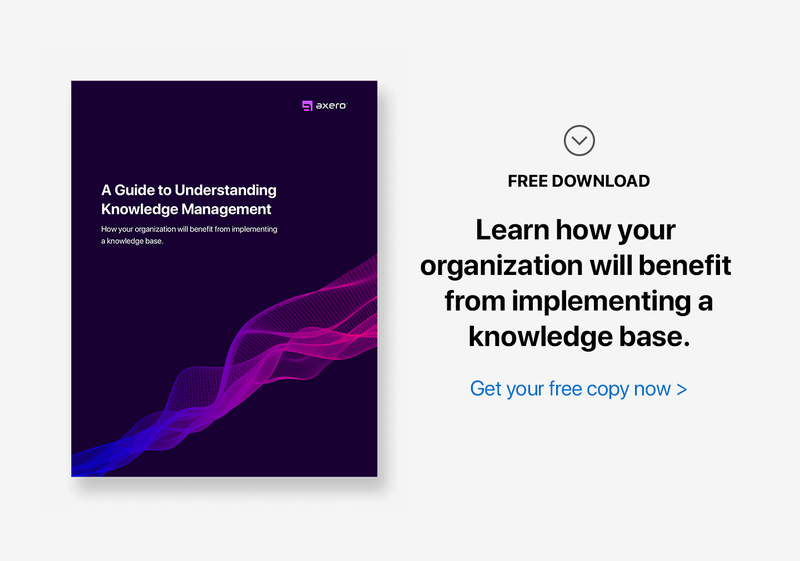 Here are 7 simple tips to implement into your knowledge management strategy that you and your staff can actually use. 1. Segment everything into spaces. How many times have you had to wade through a sea of information just to find the document or snippet of knowledge you’re looking for? It happens all too often when organizations grow, but the solution is simple—segmentation. Knowledge management software allows you to create spaces specifically for projects, teams, or groups of documentation. It prevents information overload from disrupting your ability to easily find the information you need, when you need it. Segmentation is especially useful for help desks, as it cuts down on the amount of time it takes for someone to find what they’re looking for when assisting a customer. Segmentation makes it easier to navigate your KMS and organize documents in a way that makes sense to your team. Ever introduce a new piece of software and then completely lose track of any post roll-out progress? You’re not alone. It’s one of the biggest mistakes organizations make, and it stems from a lack of benchmarks. Incorporating monthly benchmarks into your knowledge management strategy makes it possible to monitor activity within your KMS ... so you can easily assess your productivity. Benchmarks provide concrete goals for your team to achieve. Best of all, they’re completely flexible in that you can adapt them to reflect changing priorities. 3. Look beyond customer service. Your customers are the lifeblood of your organization, so providing high-quality customer service is absolutely essential. Keeping your clients happy and ensuring that their issues are addressed immediately should be a top priority. At the same time, KM is more than a means to improved customer service. It also relates to marketing, sales, HR, accounting, and more. Each is its own discipline, yet they all make use of your organization’s information resources. Consider creating different spaces (remember #1 above – segmentation) in your knowledge management software to integrate KM throughout the whole of your company. 4. Make the best possible use of search. Search is everything. It helps us to go from Point A to Point B within the Internet or your own social intranet, all while skipping over things we don’t need to see. As you'd expect, search, is a huge part of your knowledge management strategy, but it takes effort from you and your staff to make it really work in your favor. Improving search is all about embracing proper archiving standards. Every time a file or document gets uploaded to your knowledge management system, it needs to be tagged and attached to specific search terms. This will make recalling it in the future a simple, straightforward process for everyone who uses your KMS. Tag appropriately, and your KMS will become even easier to navigate. 5. Simplify your training procedures. Onboarding new employees can be tricky no matter how long you’ve been doing it. Every manager has a preferred approach to training new hires, but the more you can make use of your knowledge management system to do so, the more time you’ll save. This allows you to get back to doing your job, which can be difficult when you have a handful of new employees to monitor. Your KMS should house all of the company documentation you’ve accumulated over the years. Why take the time to train each employee from start to finish when they have the information they need to do the job themselves? Organizing a space within your KMS that is entirely devoted to onboarding is not only a good idea—it will save you countless hours. 6. Develop a framework for content creation. A KMS is dynamic, evolving over time as users influence its content and structure. Current knowledge management systems allow you to create content without ever having to leave your social intranet, saving you and your team considerable time. Developing a strong framework is a huge part of your knowledge management strategy ... so you can ensure that users maintain consistency in content creation. Think of what would happen if you tasked ten different people with writing blogs, wikis, and articles. Chances are you’d end up with ten different formats for each item type. Your framework will streamline the creation process, keeping your content aligned with your KMS structure. You can adapt your framework as needed, provided you and your staff members remain consistent when following it. Today’s knowledge management systems are essentially social networks in their own right. Sure, they house your information, but there’s more to them than that. Your KMS connects your team in a powerful community setting. Leverage your staff’s skills and experience by encouraging them to organize, create, and curate content. Make sure all users know their knowledge sharing contributions are valued and vital. Community action will enhance your knowledge management system, regardless of your organization’s size. KM will always be a dynamic challenge, requiring top-notch online collaboration tools and a focused commitment from your team. Leverage your information resources to the fullest by implementing a social knowledge management software platform and engaging your staff to meet the challenge.